A perfect blend of traditional and modern architectures, this culturally diverse destination, Hong Kong is one of the favorite hot-spots for tourism. With bustling shopping streets, colorful festivals and stunning sightseeing; Hong Kong Holidays make the trip more appealing. The Hong Kong Disneyland, situated on the reclaimed land in Penny�s Bay is a magical place of adventure and amusement is also included in Hong Kong Disneyland Packages. When enjoying on Hong Kong Disneyland Packages, this land of fun and fantasy which brings smiles on the face of the visitors. Arrive at Hong Kong airport and transfer to the hotel. Rest of the day at leisure. Stay overnight at the hotel in Hong Kong. After breakfast enjoy full day tour to Ocean Park � one of the Hong Kong favourite attractions. It is located southern side of Hong Kong Island. The three main attractions are Low Land, Head Land, Tai Shue Wan. Stay overnight at the hotel in Hong Kong. After breakfast check out from the hotel and transfer to Disney � A 24 hour�s entertainment resort. Arrive and check in at the hotel. Today you can enjoy full day at the resort with various cartoon characters and enjoy various rides in each land. Stay overnight at the hotel in Disneyland. 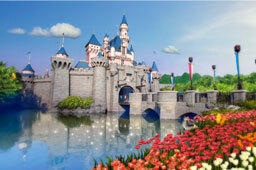 After breakfast, check out from Disney hotel and transfer to Hong Kong airport for your flight back to home bound. • Return Airport Transfers by seat-in-coach basis (Airport/ Hotel / Pier Kowloon Side) with 1 Free Luggage. • One Day Pass entrance ticket to Disneyland. • Anything not mentioned in "Inclusions"
• Expenses of any personal nature (phone calls, laundry etc).